Coconut Cake. North and South. Behind the door was another table, decked out for tea, with a white tablecloth, on which flourished the cocoa-nut cakes, and a basket piled with oranges and ruddy American apples, heaped on leaves. It appeared to Mr. Thornton that all these graceful cares were habitual to the family; and especially of a piece with Margaret. During my teenage years, in the absence of a love story in my own life, I lost myself in fictional romances. I sat in drawing rooms and walked in gardens with Elinor Dashwood and Edward Ferras. I fell in love with George Emerson over a dinner table in Florence. My heart broke for the English patient, and his memories of Katharine Clifton. I took a seat in a Manhattan restaurant alongside Carol and Therese. I wandered dark hallways in Thornfield, and then escaped with Jane Eyre in the middle of the night. I agonised with Stevens as he recalled lost moments with Miss Kenton. I swooned at the letter sent from Frederick Wentworth to Anne Elliot. With all this in mind, I can’t quite believe it took me until my late 20s to discover Elizabeth Gaskell. It is perhaps unsurprising; aside from Cranford, her most famous work, her books suffered in the 20th Century, dismissed as ‘feminine’, criticised for inadequately addressing the social concerns she had wished to explore, and fell into relative obscurity. And so, when I asked about early Victorian literature at school, I was directed instead to the Brontës, to Dickens, and to Makepeace Thackeray. More recently, Gaskell’s books have experienced a renaissance of sorts, and she has come to be recognised as a feminist writer, one who explored social class and the role of women from a unique vantage point. North and South’s Margaret Hale, for instance, who has a brother with a death warrant out against him, an oft-poorly mother, and a well-meaning but ineffectual father, is outspoken, grounded, and independent; a thoroughly modern heroine. And her relationship with John Thornton grows throughout the narrative until it emerges as one of equals. 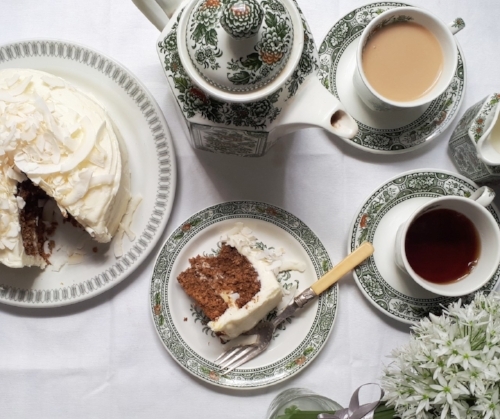 These cakes are on the table during Margaret’s first formal meeting with Mr. Thornton, owner of one of the local cotton mills. Given how quickly Dixon pulls the afternoon tea together, it’s likely that they’re similar to Mrs Beeton’s cocoa-nut cakes/biscuits, made with just beaten egg, sugar, and coconut. But I wanted something that truly ‘flourished’ on the table. And so, I adapted an Eliza Acton recipe instead – this started life as her cocoa-nut gingerbread cake. The addition of lemon curd and icing (and the eggs in the batter – to quite literally give it a lift), are my own; ones I sheepishly acknowledge that sensible, conservative Dixon would not approve of. But it’s my birthday today, and so I have taken liberties. 1. First, make the lemon curd. Add the lemon juice and sugar to a heatproof bowl, and place over a pan of simmering water. Whisk until the sugar is dissolved, and then add the beaten eggs. 2. Whisk constantly, with the pan below just simmering, until the lemon curd thickens. When it is ready, the whisk should leave visible lines in the curd. Remove from the heat, whisk the butter in, bit by bit, and spoon into a jar. Cool in the fridge. 3. Preheat the oven to 160C fan. Melt the treacle, dark brown sugar, and butter in a small saucepan. Add the ground ginger and the lemon zest. Allow to cool, and then beat in the eggs. Tip the flour, baking powder, and coconut into a bowl, and then mix in the liquid ingredients. 4. Pour into a lined 15cm cake tin, and bake for 45 minutes. The cake is ready when a skewer poked into it comes out clean. Cool in the tin for ten minutes, and then on a wire rack. 5. To make the icing, beat the butter and lemon juice together, then add the icing sugar, a bit at a time, until the icing is light and creamy. Beat the milk in too. 6. To decorate the cake, slice it in half so that you have two layers. Spread a thick layer of icing onto the bottom half, and then spoon a layer of lemon curd on top. If you like, a little border of icing piped around the edge will provide a nice barrier, and prevent the curd from leaking out. 7. Place the second cake layer on top, and spread a thin layer of icing over the whole cake. This is the crumb coat – it keeps any cake crumbs in place, and prevents them showing through the top layer of icing. Refrigerate this layer of icing for half an hour before covering the whole thing with a thick second layer of icing. Top the cake with coconut flakes and serve. Dumplings. The Kitchen God's Wife. Back home, I told the cook girl to boil enough pots of water and to chop enough pork and vegetables to make a thousand dumplings, both steamed and boiled, with plenty of fresh ginger, good soy sauce, and sweet vinegar for dipping. Hulan helped me knead the flour and roll out the dough into small circles. I admit I was at first impressed by her cooking skills. She worked fast, pushing hard against her rolling stick. She was able to roll out three skins for every two that I made. And she always grabbed just the right amount of meat filling to dab in the middle of the skin, never having to add a little more or take a little off. With one pinch, she closed the dumpling off. A couple of weeks ago, I spent an evening working on a food truck in Liverpool. My friends Shelly and Mia invited me to make some sweet canapés for the launch of their new venture: Pao! and I spent the day helping with service for the savoury food too. I had a brilliant evening and left vowing to eat more kimchi, occaisionally swap the horseradish for wasabi in my Bloody Marys and learn how to make dumplings from scratch. I keep dumpling wrappers in my freezer, ready to make prawn and leek potsticker dumplings when I fancy a quick supper. The wrappers are cheap, easy to use and available just down the road from me, but I have long been meaning to make my own, to see if I could tell the difference. On the 6am train home to London, still recovering from my evening in the food truck, I read The Joy Luck Club, and promptly decided that the dumpling plan needed to come to fruition sooner rather than later. Centred around four Chinese American mothers and their first-generation daughters, the book introduces us to a wonderful collection of characters, brought together around a mahjong board and a table full of food. My love for this story encouraged me to go on a bit of a spree, and the scene above actually comes from Amy Tan's follow-up, The Kitchen God's Wife. 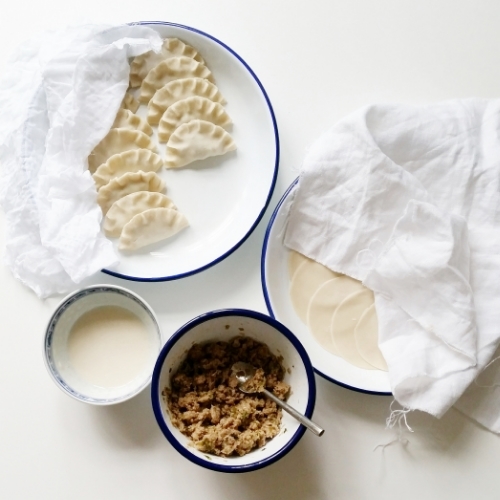 It's the shared task of making 'a thousand' dumplings that inspired the recipe below. Although I made these solo, taking my time on a contemplative afternoon, I can imagine making them with my family - a production line of the matriarchal figures I grew up with rolling, filling and pinching the dumplings closed. This is not food for a quick supper, but it's all the more special for the time you've spent putting it together. Proper slow food (cooked fast). 1. First make the dough for the wrappers. Add the flour and salt to the mixing bowl, then pour the water in. Stir it with a wooden spoon to combine and then, once cool enough to touch, incorporate the ingredients with your hands. Cover the bowl and allow the dough to rest for half an hour. 2. While the dough is resting, prepare your filling. Chop all filling ingredients finely (except the mince and, obviously, the liquids), or mince them with the microplane. Warm the sesame oil in a frying pan over a medium heat, and fry the garlic for a minute, stirring to ensure it doesn't brown. Add the spring onions, ginger and chilli, cook for another minute, then add the pork. Cook for five minutes, moving the meat around to ensure it all cooks through. Add the lime zest, lime juice and soya, cook for a final minute and remove from the heat. Set aside to cool. 3. Once the dough has rested, knead it for around ten minutes until smooth. At the start, the dough will be hard to manipulate but keep working, stretching the dough out over your bench with the heel of your hand. It will get there. Once smooth, cut the dough into six pieces and return five of these to the fridge, wrapped in cling film. 4. Flour your bench, roll one piece of dough out to a couple of millimetres thick, then cut into rounds with an 8cm biscuit cutter. Set each wrapper aside, covered with a tea towel. You might like to put a bit of greaseproof paper between each one to ensure they don't stick, but I played with fire, and just layered them, then peeled carefully when I came to using them. Repeat the wrapper making process with the rest of your dough. Keep any scraps, re-knead, and cut out again. 5. Once your filling is cool and wrappers have been rolled, mix the flour and water for sealing the dumplings and set up a bit of a production line. Then start filling and closing the dumplings. Place a generous teaspoon of the mixture into the centre of the wrapper. Run a finger, moistened in the flour and water, along the top edge of the wrapper, and fold the other side over the top to create a semi circle. 6. Working from the edge of the mixture, push the wrapper closed, ensuring there are no air holes, then seal the edges. Starting at one corner, pinch the dough between your thumb and forefinger, with your middle finger supporting the dough underneath. Repeat at close intervals along the edge. Store each finished dumpling under a cloth and continue with the rest of the wrappers and mixture. Once you've finished, put a large pot of water on to boil. 7. To prepare the sauce, put all the ingredients in a small saucepan and bring to the boil. Reduce the heat to low, and leave to simmer away quietly while you cook the dumplings. 8. Once the pot of water is boiling, reduce to a confident simmer, then drop the dumplings in in batches, giving them room to move. Cook for five to six minutes, then remove with a slotted spoon. Allow to drain, then transfer to a serving plate. Spoon the sauce over the top and serve immediately. Sticky Ginger Cake. Five on a Treasure Island. It wasn't long before all four were sitting down to a good tea. Aunt Fanny had baked new scones for them, and had made a ginger cake with black treacle. It was dark brown and sticky to eat. The children finished it all up and said it was the nicest they had ever tasted. I'm not really sure why it's taken so long for Enid Blyton to make an appearance on this blog. Since starting this, people have spoken to me about the food in her stories more than those of any other writer. It seems that, for those of us who grew up reading her books, it's the lemonade, the boiled eggs, the sandwiches and the tinned sardines that have stayed in our heads. Personally, I can't think of many more idyllic days than one spent in Dorset, on your own island, with a picnic basket, a few books and an afternoon nap. Enid Blyton started writing The Famous Five series during the Second World War, at a time when many of her young readers in Britain would have been experiencing rationing. I've therefore gone for a more austere recipe than I might otherwise have done - heavy on root veg that people would have been growing at home. This cake is a perfect one for a picnic too. You can wrap it up in the paper you've lined the tin with, and keep it for a few days before cutting into it; the flavour will just keep improving. 1. Preheat your oven to 180C. Grease the tin with a little vegetable oil and line with a sheet of baking paper, folded where needed so that it fits into the round tin. You'll be storing/transporting the cake in this paper later, so don't make any cuts into it. 2. Crack the eggs into the bowl and beat with the dark sugar for a few minutes until very thick. Beat in the treacle and oil until smooth. Stir in the veg and the stem ginger. 3. Mix the flour, baking powder, bicarbonate of soda and ground ginger together. Fold them into the cake mix gently, then pour the batter into the lined tin and place in the oven. 4. Bake for about 50 minutes, or until a skewer comes out with only a couple of crumbs of cake attached. Cool in the tin for around ten minutes, then transfer to a cooling rack to cool completely. Don't panic if it sinks a little in the middle; it's a very moist cake! 5. You can eat the cake as is but, for an extra ginger hit, I prepared a very simple icing. Mix the ginger syrup with the icing sugar in a bowl and drizzle it over the top of the cooled cake. Allow it to set a little before wrapping it up, popping it in a picnic basket and heading off on another adventure (as Enid Blyton - and my stepdad - would say). The suggestion prompted an exchange of glances between Cecilia and her brother, and thus their discord was resolved. I realise that presenting a cocktail as my first recipe in January could be a little cruel... at least for those of you two days in to a 'dry January'. To be fair though, you could certainly consider this drink as a dessert rather than a cocktail (if you've vowed to forego desserts too, I'm not quite sure this one is going to be for you). For those of you still with me, this is a truly special drink, one I have very much enjoyed developing. Unlike the odious Paul Marshall, I don't pretend to be a master cocktail maker. More often than not, I'll just order a gin martini in the manner of Noel Coward: "A perfect martini should be made by filling a glass with gin, then waving it in the general direction of Italy". But I do like to play around with flavours, and my experience with rum tells me it works well with winter spices. So although Cecelia and Leon enjoy this cocktail on the hottest day of the summer, I've developed one instead for the dark days of January - I've left out Paul's crushed ice, which can do funny things to melted chocolate, and have added some nutmeg and ginger (not to mention rum) that will warm you to your toes. 1. Place the chocolate in the small saucepan with the rum, and set over a very low heat. Stir constantly, ensuring that the chocolate doesn't burn on the bottom of the pan. 2. Once the chocolate has melted, take the pan off the heat, add the ginger syrup and ground cinnamon and continue to stir - the alcohol and chocolate will come together into a rich, thick liquid. 3. As soon as this happens, divide between two glasses and grate nutmeg generously into each glass. Serve immediately and drink while warm. Gingerbread Biscuits. Hansel and Gretel. ...when they came nearer they saw that the house was built of bread, and roofed with cakes, and the window was of transparent sugar. “We will have some of this,” said Hansel, “and make a fine meal. I will eat a piece of the roof, Gretel, and you can have some of the window - that will taste sweet.” So Hansel reached up and broke off a bit of the roof, just to see how it tasted, and Gretel stood by the window and gnawed at it. I’ve discussed previously that I’m a little ambivalent towards sweets (chocolate, of course, is another story...). As such, gingerbread houses aren’t really for me - the gingerbread itself is the bit I'm more like to enjoy, and it often suffers because of the need for structural stability. To be honest, I’d much rather have a good gingerbread biscuit. They’re one of my favourite things to give as Christmas gifts. A jar of homemade biscuits never goes begging on the Boxing Day comedown, and these deliciously spiced ones are perfect with a mid-afternoon cuppa. That said, Christmas (in my life at least) does regularly include a gingerbread house. And, to be honest, it's become one of my favourite Christmas traditions. The wonderful Jacob family, who I spend my Christmases in England with, have a tradition I have been welcomed into: the creation of a tremendously detailed gingerbread house each year. As well as being generally brilliant human beings, my honorary siblings Anna, Tom and Mia are the most wonderfully irreverent bunch I know - so we end up making the least Christmassy gingerbread houses known to man. This year it was a toss-up between a Serial house and a Scottish referendum house - the Scots won. 2009. My first year in the UK - the Greek Taverna. With Socrates, and Nana Mouskouri, on the roof. Jonah from Summer Heights High and Toadie from Neighbours. If you love sweets, do go the whole hog and make a traditional (or non-traditional) gingerbread house yourself - I’m not denying they can be truly spectacular. Our house will continue to come from Ikea, and will be decorated with something suitably ridiculous. And I'll make these gingerbread biscuits, unadorned with sweets and icing, to enjoy with tea. 1. Put the maple syrup and spices in the small saucepan over a low heat, stirring until the spices are dissolved. Remove the saucepan from the heat and, once cooled enough to put your hand against, stir in the cream and mix well to combine. 2. Beat the butter and sugar until light and creamy. Beat in the egg. Sieve the baking powder and flour together and then add to the butter mixture in stages, alternating with the maple syrup mix. Beat until the mixture is very smooth. It will be a bit sticky; this is absolutely fine. Cover the bowl with cling film and place in the fridge or on a cold windowsill for at least a couple of hours, or overnight if you're getting organised ahead of time. 3. Heat the oven to 190C and line two trays with baking paper. Bring the dough out of the fridge and take a large handful. Place the remainder back in the fridge to keep it cool. Lightly flour your bench, your hands and your rolling pin and, working quite quickly, roll the biscuit dough out until it is about 7mm thick. Using a floured biscuit cutter, cut the dough into shapes and transfer them to the baking tray, leaving a small amount of space for them to puff up. Squidge any leftover dough back into a ball and roll out again. 4. Transfer the tray to the oven and bake for around 8 minutes, until the very tips of any corners are starting to brown. You can leave them for longer (up to 15 minutes), but I like them quite crumbly and soft. They will continue to harden once out of the oven. So, once cool enough to handle, transfer them to a cooling rack until stone cold. Continue to bake in batches until the dough is used up. 5. Once cooled, sprinkle with icing sugar and transfer to an airtight box. The biscuits will keep for about ten days in here, so you can prepare them a good couple of days before giving them as a gift. This recipe is from Tessa Kiros' lovely Apples for Jam - and is one she attributes to a Finnish friend.